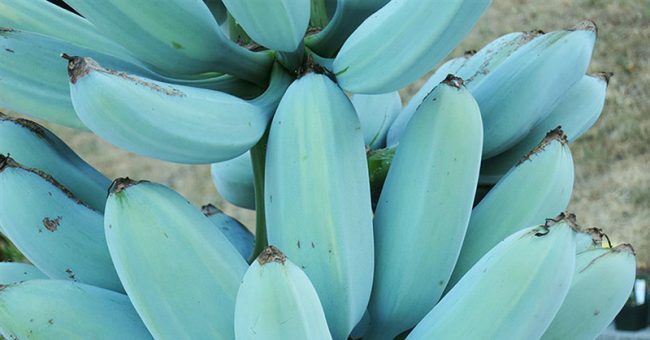 The Blue Java is a variety of banana that has a taste and consistency that are strikingly similar to vanilla ice cream. It is also known as ice cream banana in Hawaii, Cenizo in Central America and Hawaiian banana in Fiji. It has a sweet aroma and an aqua blue peel when unripe. When ripe, these bananas are greenish or pale yellow, and the inside is whitish yellow. It originates from South East Asia, and unlike other banana varieties, it can keep growing in temperatures as low as 20F / -7c. Bananas are low in fat, but energy dense, so 100 grams of banana provide about 0.3g of fat, 22.8g of carbs, and 89 calories. They are abundant in potassium, that supports proper muscles contraction, and nerve cell response, and regulates heart pressure. Blue Java bananas contain a fair amount of fiber, as well as several antioxidants that strengthen the immune system. They are also high in vitamin B6 and C, magnesium, copper, manganese, and protein. The high pectin and resistant starch content moderate blood sugar levels after meals and suppress appetite by slowing the emptying of your stomach. These fruits also rank low to medium on the glycemic index (GI). The high amounts of vitamin B6 help the body to synthesize its own serotonin, meaning that the consumption of these bananas significantly improves mood. A smoothie or delicious banana ice cream with 2-3 Blue Java bananas will provide over 75% of your RDA of vitamin B6. Furthermore, these bananas are abundant in non-digestible fibers like cellulose, hemicellulose, and alpha-glucans, which prevent constipation and restore and maintain regular bowel function. The resistant starch also escapes digestion and ends up in the large intestine where it becomes food for the beneficial bacteria in the gut. This banana variety has wide, thick, and strong leaves, which can be used instead of aluminum foil, and parchment paper for cooking, as well as for The Blue Java Banana has wide, strong, and thick leaves like any other banana variety. These leaves can also be used for baking, boiling, steaming, grilling, and drying. You can replace ice cream with these bananas, or add it to various recipes for an added vanilla flavor, like smoothies, banana cakes, oatmeal cookies, pancakes, and more. -- They also require a lot of fertilizing, so you will need to use an NPK fertilizer with nutrients in the ratio of 3:1:6 to nurture it. You will need to spray a cup of fertilizer around the roots a month for a one-foot tall plant.